GOLDEN DAYS: A lot can happen in two years. 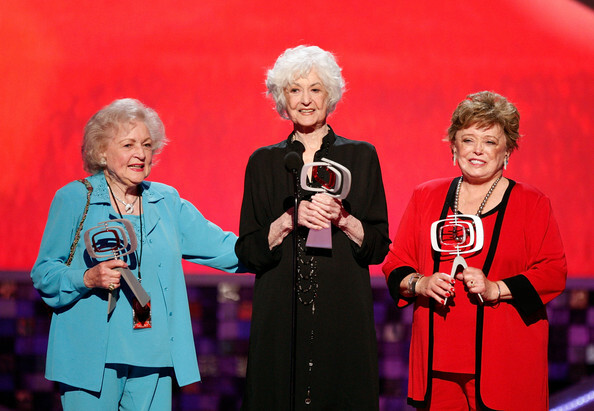 It was in the spring of 2008 that Beatrice Arthur, Betty White and Rue McLanahan reunited at the TV Land Awards in Los Angeles to receive the Pop Culture Award. It would be the last time the three Emmy winning comedy legends and stars of The Golden Girls would be seen together publicly. Bea died from cancer the next year while Rue passed away earlier this year. And 88-year-old Betty, of course, goes on and on. This year she has been elevated to national treasure as well as being an Emmy winner, SNL host, star of a new hit sitcom (Hot in Cleveland) and co-star of a new movie (You Again), highly-coveted series guest star (NBC’s Community next week, ABC’s The Middle last season). It’s been reported, including here on this site, that Bea was not fond of Betty off-screen. I personally witnessed her coldness to her co-star at a previous reunion but on this night, they acted warmly to each other. As they received the award from Steve Carrell, Betty said to the audience: “The nicest thing about receiving this lovely award is that we get to see each other again” and Bea clasped her hand.